The dolphin is a symbol of joy, of being able to ‘go with the flow’ of life, free from worry. 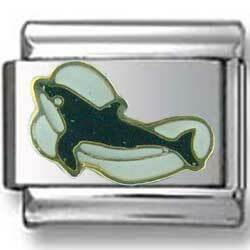 Our charm features black dolphin painted on a white background incased in gold enamel. The glistening stainless steel base serves as a shiny support. You should wear the symbol of dolphin as a way of showing your intention to become more at one with the breath of life and to promote a connection with laughter and joy.